Have you wondered what it takes to run a small factoring business by yourself or with just a family member? What do you need for day-to-day operations in terms of equipment, technology, documentation, and know-how? Factoring receivables can be a lucrative business with high returns, but you need to know how to manage the business with minimal overhead. Overseeing employees adds significant additional costs and responsibilities. This informative ebook is written in the first-person by Jeff Callender, a well-respected small invoice factor who has been in the business since the mid-90s. Jeff shows simply and clearly how he has run his company year after year with no employees. Discover how his use of current technology, outsourcing, and common sense can enable you to manage a full portfolio of clients without the expense and complications of a big payroll. Learn his numerous tips and secrets as to how you can not only enjoy running a very small factoring operation from practically anywhere, but thrive as you do!. 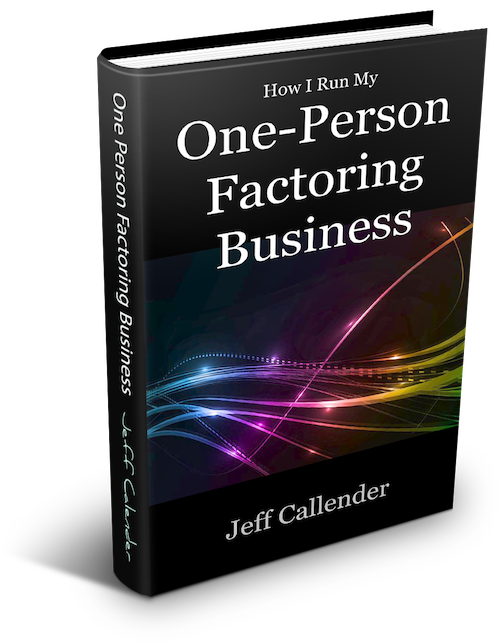 OR…Get How I Run My One-Person Factoring Business AND a copy of the 2013 Directory of Factoring Companies for only $34.96 – Use This Button…..
About the Author: Jeff Callender began doing what this book teaches in 1994. He has written books and numerous articles, consulted, and been a public speaker to thousands of people about how to profitably factor small receivables. No one comes close to providing as much information on the subject as he has. About the Ebook: This book is delivered in PDF format via instant download upon completion of your order. If you prefer a hard copy please feel free to print for your own use from your printer.